The dynamic duo of Malta and Gozo are fast becoming top of most people’s bucket lists – and it’s not hard to see why. With over 300 sunny days a year and sizzling highs of 28°C, it’s the perfect post-Summer hotspot and one of September's hottest destinations. A classic example of looks being deceiving, these islands are proof that size most definitely isn’t everything. Adorned in spectacular scenery, gorgeous beaches, magnificent marinas, prehistoric temples and hidden coves – their charm is hard to resist. The compact scale means your villa will make a perfect base wherever you choose to stay. Valletta, Malta's vibrant capital, plays host to a staggering amount of festivals every year! From fireworks to jazz music to major outdoor concerts, prepare to embrace the thriving nightlife and celebrate Mediterranean style with the locals. Speaking of which, you’ll be hard pushed to find friendlier locals anywhere. Welcoming and warm, they’ll go above and beyond to make your visit as special as possible – ask for directions and they’ll most likely walk with you to make sure you get there! More than just a historic relic (although there’s plenty of historical sites to stumble upon), Valletta is jam-packed with delicious eateries, quirky side streets, and beautiful gardens. 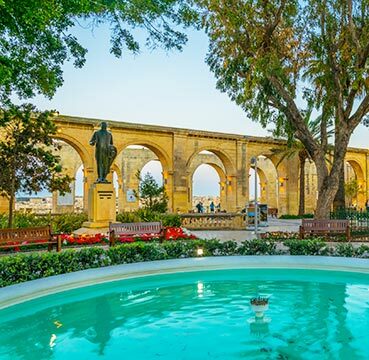 For the best of the bunch, head to Upper Barrakka Gardens for a panoramic view to end all panoramic views! Sit and watch as the world goes by in the Grand Harbour and the Three Cities. From new to old, head to the mythical Mdina. Malta’s original capital, the “Silent City” is peaceful and timeless. Sitting proudly on top of a hill overlooking the Maltese countryside, this ancient walled city serves up stunning vistas from its tall fortifications. And it’s not just views it’s serving up! Grab a slice of the delicious chocolate cakes from the Fontanella Tea Garden. One of the most instagrammable food and view combos going. Once your taste buds have been satisfied, set out on a stroll around the cobbled streets and little squares. Don’t forget to look up and admire the pristine shuttered windows and immaculate flower arrangements, adding bursts of colour to the sandy brickwork. An (almost) no-car zone, wander at leisure and soak up the sense of stepping back in time! Malta’s sister island Gozo is outdoor living at its best. A remarkable coastline, majestic high cliffs and a huge amount of natural attractions from Saltpans to Dwejra Bay. 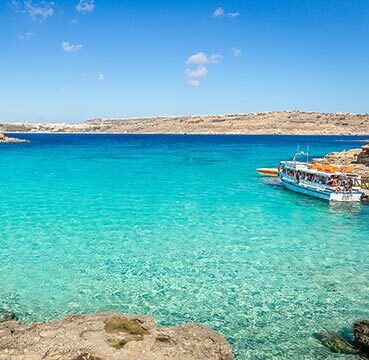 Not to mention the breathtaking Blue Lagoon, which is a short ferry ride away on nearby Comino. Movie fans can spot filming locations from some of their favourite films and television shows. Game of Thrones has made use of numerous sites on both Gozo and Malta. How many can you find? A diver’s paradise, Gozo is surrounded by rich marine life, underwater caves and wrecks, and a whole host of wildlife! If you’re lucky you might even spot octopi, dolphins, stingray and parrot fish. The sea is usually calm and warm and revered as one of the top diving destinations in the Mediterranean. Another utterly unmissable island – Sardinia is all the finer things rolled into one. Chic resorts, natural beauty, prehistoric architecture and dreamy beaches give visitors a little bit of everything. Balmy temperatures of 22°C (with highs of 26°C) are perfect for lazy days by the pool or outdooring and exploring, giving you the perfect mix of relaxation and recreation! The middle of the island is a wild and remote wilderness, filled with valleys, gorges, canyons, forests and towering mountains. Sandwiched between long stretches of white powder-sand coastline in the North and beautiful unspoilt seclusion in the South. A coastal drive here is a no-brainer, and there are plenty of photo opportunities to be had as you meander your way through winding country roads. All hail Costa Smeralda (The Emerald Coast)! The beaches here are out-of-this-world – and yes, the sand really is that white! One of the most popular spots on the island, Pevero Beach, has shallow waters perfect for a paddle and stunning natural surroundings. Another coveted favourite is Liscia Ruja (or Long Beach), which lies between the villages of Portisco and Cala di Volpe. Its length makes it an ideal setting for a long romantic walk along the waterline, with a beautiful view of the Soffi and Mortorio Islands. 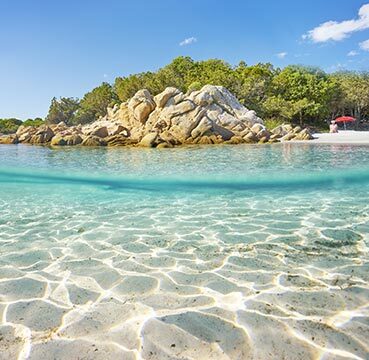 Truth be told, there are far too many beaches for one Sardinian holiday – so you’ll need to choose wisely (or visit again)! Inland, there’s a whole host of highlights in the form of Nuraghi. 700 (give or take) extraordinary structures that can’t be found anywhere else on the planet! A Bronze Age mystery, the purpose of these remarkable bee-hive buildings is still unknown. 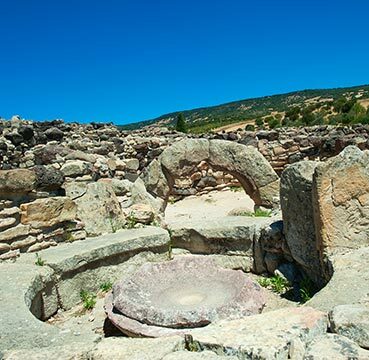 Dubbed Sardinia’s ‘Stonehenge’, it’s a must see for budding history enthusiasts or anyone on the hunt for a unique experience! One of the most famous sites, Su Nuraxi, has the most impressive displays of these crazy constructions. You can climb 11 towers, amble along prehistoric passageways and squeeze through needle tight escape routes. In true Sardinian style, you can have the best of both worlds when it comes to your evenings. Whether you enjoy a laid-back local restaurant to wine and dine under the stars, or a spot of drinking and dancing the night away – you’ll be spoilt for choice. The only thing you need to remember, pack an appetite for multi-course meals! Food is a huge part of Sardinian culture, so be prepared to fill your bellies with recognisable Italian favourites as well as more traditional dishes. Food heaven ahoy! 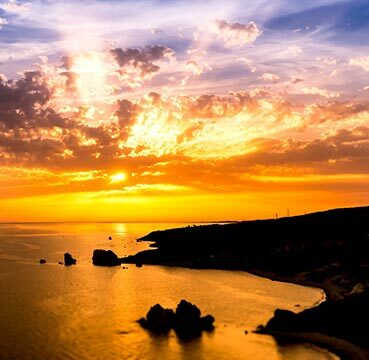 An island that offers up endless variety and charm, there’s something truly magical about Cyprus in September. With temperatures as toasty as 29°C (or an even toastier 34°C inland) there’s still plenty of sunbathing to be done! Mother Nature was showing off when she crafted this beautiful Island. An endless world of jaw-dropping scenery unfolds against glittering shores. Golden beaches and rugged coastlines are set against fragrant forests and mountains blanketed in trees. Traditional villages nestle among lush greenery and tell a story of the rich culture and history of Cyprus. Revealed in classic Greek temples, Roman theatres, Gothic cathedrals and crusader castles. The locals deserve a mention all of their own, with joyful kindness and hospitality adding to the charm of this carefree paradise. People here like to eat well – great news for foodies! Sharing a meal is an important part of Cypriot culture. Long, lazy evening meals over hearty dishes in nearby tavernas are a must. Tuck in to mouth-watering mezes (and don’t forgot that side of halloumi), or make the most of harbourside locations and opt for freshly caught fish. 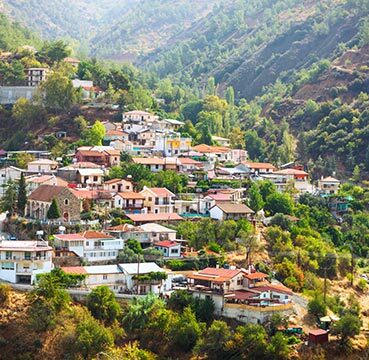 The Troodos Mountain range stretches across the western side of Cyprus, with Mount Olympus sitting proudly as the highest point on the whole island. You might recognise the name? Famed in Greek mythology as the home of Zeus (and his friends) it’s well worth a visit. The entire national park is the gift that keeps on giving. Countless picnic sites and nature trails as far as the eye can see. Wonderful waterfalls are just waiting to be discovered deep in the wild heart of the wilderness. So what’re you waiting for? Embrace your inner boy scout and head out on a hike! From flocks of flamingos to green turtles, see how many creatures you can spot on your travels. Life’s a beach, and Cyprus doesn’t disappoint. Sink your toes into warm sands and warmer waters. From private havens to populated strips, you’ll soon find the perfect spot to top up that tan. Not one for sitting still? Jump into the big blue and make a splash. You’ll never be out of your depth with a huge range of gentle activities in shallow waters. Of course there are more adrenaline pumping escapades for the thrill-seeking among us! Wind down by watching seals and dolphins play in the calm, crystal-clear seas and stroll along the silky stretches of sand. Make a trip to Aphrodite’s Rock and Beach in Paphos. Another Greek mythical gift from the gods, it’s a must. Head over at sunset for a serene mix of reds, oranges and pinks. A truly otherworldly experience.